What are the economic and environmental implications of shale gas extraction? 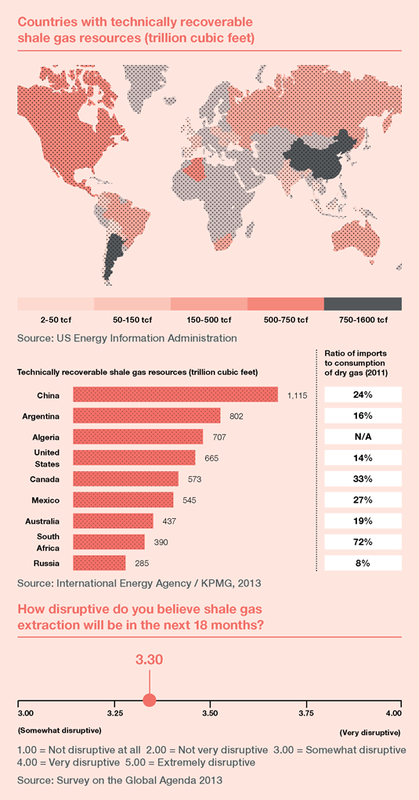 Shale gas has the potential to trigger a revolution in the global energy landscape. It could change the rules of the game. Today there is a small group of countries that are energy suppliers. With shale gas, a whole new group of suppliers could join the market and the impact would be felt worldwide. The availability of shale gas on the market would alter prices, turn some producer countries into consumers and shift the balance of trade in favour of those with shale. OPEC countries are worried about the development of shale gas. They need high oil prices to pay for social stability, but that will be threatened if gas is substituted for oil in areas such as transportation. This is already happening in places such as California and Texas, and if gas prices stay low, a continued substitution is very possible. American industry will be a huge winner, thanks to cheap gas and electricity creating cheaper inputs for the chemical and manufacturing sectors. And by reducing oil imports and starting exports of liquefied natural gas (LNG), the US trade balance will be significantly improved. The rise in the accessibility of shale gas has been driven by technologies such as horizontal drilling and hydro-fracturing through the existing pipeline system, which makes it economically feasible to access these deposits. The new supply is having huge knock-on effects globally – Russia is planning to develop gas fields in the Arctic Ocean and had planned to sell primarily to North America, but with the new gas supply in the US, Russia’s plans may no longer be feasible. LNG exports from the US will provide diversity and create pressure for other gas suppliers to reduce prices. There are many impacts environmentally. On the one hand, gas is less polluting than oil, so substituting shale gas for petroleum and coal could result in lower CO2 emissions. On the other hand, there has been contamination of drinking water from the leaked gas, or from the recycling of water used in shale gas extraction. Much of the environmental impact could be prevented if we choose sites more carefully or if we improve the breakdown of chemical substances used to extract shale gas, making the water recycling eco-friendly. It can be solved through improved technology, but this costs more and the investments in improving technology need to increase. There is a constant balancing act – the shale gas price needs to be high enough for producers, but low enough so as not to undermine the economies of the emerging markets that consume it. Shale could become commercially viable, but it depends on increased levels of investment in the technologies, such as fracking and horizontal drilling. It also depends on designing the necessary smart regulations in the US and other countries with potential to enter the market.